Providing accurate medical transcription service, fast turnaround, and outstanding customer service is our only priority. When you outsource your medical transcriptions, you need a medical transcription company that provides flawless medical transcriptions with a fast turnaround. We also work with any EMR (electronic medical records) and will merge your dictation into the EMR system of your choice. Our medical transcription company has the capacity to take on any medical transcription job, no matter how big or small. Based on our experience and expertise, our talented team of medical transcriptionists give your medical transcription project their undivided attention until the job is done. 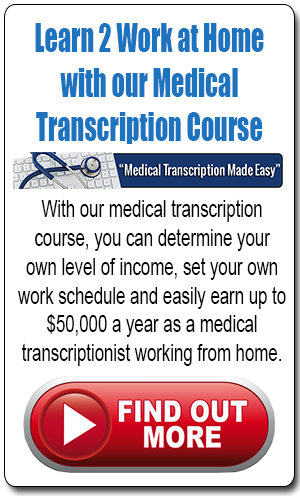 Our medical transcription company employs medical transcriptionists with more than 20 years of experience, knowledge and expertise in the medical transcription industry. There is no medical terminology that we have not encountered. This is why all of our clients continue to rely on us, because our medical transcription company continues to strive to provide them with accurate medical transcription services with a quick turnaround. Medtrans is a medical transcription company that has built solid relationships with its clients, giving the company long-standing stability. 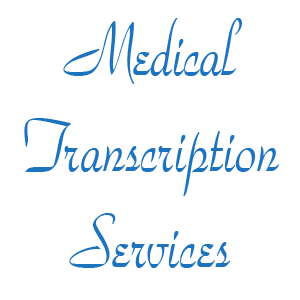 This means we can provide you with the best possible prices and the fastest deliverability rates on digital medical transcriptions – guaranteed! Our medical transcription company can provide medical transcription services using digital voice recorders or direct phone line dictation. 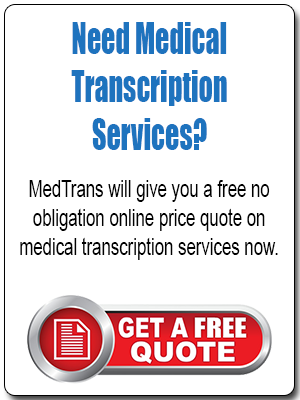 All completed medical transcripts can be instantly downloaded right off our secure Internet site. In the midst of growing concern for increased patient awareness and the liability that entails, our medical transcription service experts will help you dedicate more time and effort toward what you do best – taking care of patients, and growing your practice. We deliver everything you need to succeed; accurate medical transcriptions, immediate attention, faster turnaround, and smart solutions. In a Hurry? We provide for STAT dictation and you can easily flag the audio files you need rushed. For a FREE no obligation price quote on our medical transcription services, please contact our medical transcription company Toll Free: (866) 365-3843 or local (480)-759-1285 between 8am and 5pm Mountain Time …or complete the form below ANYTIME, and we will contact you at your convenience. What dictation method do you prefer to use with medical transcription service? How many medical practitioners/physicians within your organization need medical transcription services? What type of files will be submitted for medical transcription service? What is the average number of lines generated daily (65 characters per line with spaces) needing medical transcription services? When will you need this medical transcription service? Please describe any additional requirements you have with regard to your medical transcription needs. © Medtrans. All rights reserved.